1. Soothing puffy eyes. 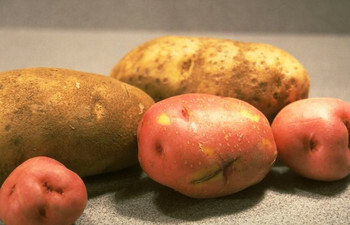 We all know cucumber can relieve tired eyes, but did you know the humble spud can too? Lie down for 10 minutes with a slice of potato over each eye. Then chuck the potato slices in the composter and take a look a mirror. You will be pleasantly surprised: the potato makes the puffiness go away. Really, it works, I have no idea how or why, but it does. Next time you have a big night out grab that spud and let it work it's magic. 2. Silver cleaner. I've explained before how potato water can clean and polish stainless steel, well it also cleans silver. Next time you have a saucepan of water in which you have been boiling potatoes, don’t pour it down the sink. Use it to clean your silver jewellery and other silverware. Just drop your silver into the warm water and leave it for an hour. After the hour, take your magically cleaned and shiny silver from the water and give it a rinse then dry with a soft cloth. 3. Soothing sunburn. I don't get sunburnt very often thanks to Slip, Slop, Slap being drummed into me when I was younger and our summer is almost over but the potential for sunburn is always present for we Aussies. A potato poultice can do wonders for sunburn. Grate a handful of raw potato, wrap it in a piece of cheesecloth or a thin linen tea towel. Apply to your painful sunburn. The soothing effect also applies to regular burns, if the skin is unbroken. 4. Removing broken light bulbs safely. Have you ever been faced with the jagged little problem of removing a smashed light bulb from its socket? When it happens, you can remove the bulbs safely. Cut a suitably-sized potato in half, then jam one of the halves into the broken bulb, and twist to remove the bulb from the socket. 5. Saving over salted food from the bin. Great-grandma knew how to rescue an over salted soup or stew - she used a potato or two. We have all been there: the soup is bubbling away on the stove, then you go and ruin in with too much salt. Don't despair, help is at hand. Slice a potato and drop it into the pot while it's still cooking. The potato will absorb the salt. Take the potato out before you serve it. Interesting tips! By the way, #5 also works for a burnt dish.